Answer all of the following questions. 1. Describe the narrator (his social position, personality, motivations, etc.). Why does he consider himself a “misanthrope”? How does his experience on the Izu peninsula “cure” him of his misanthropy? 2. Describe the setting. Make a list of all the place names that appear. 3. What is the “certain hope” that the narrator harbors in the opening scene. What does he seem to be plotting? 4. Describe the “dancing girl” Kaoru. How does she seem to hover between the two realms of childhood innocence and young womanhood? 5. Make a list of the minor characters in the work. How are they related? How do the older women behave toward Kaoru? Toward the narrator? 6. Kawabata was very involved with the New Perceptionist group (Shinkankaku-ha) when he wrote this work. What modernist techniques can you find in the work? 7. Why does the narrator “sit rigid” in his room on the night of the party? What does he fear might happen to the dancing girl while entertaining male guests? 8. Discuss the outdoor bath scene in which the narrator sees the dancing girl naked. Why does he feel that “suddenly a draught of fresh water seemed to wash over my heart”? Why does he feel “as though a layer of dust had been cleared from [his] head”? 9. Does the plot of “The Izu Dancer” correspond to the Freytag Pyramid? Explain. 10. It has been forty-nine days since the prematurely born baby died. What is the significance of forty-nine days in Buddhist funerals? 11. Discuss the class distinctions that appear in the work. How are the entertainers viewed by the local residents/inn managers/etc.? How does the narrator’s attitude toward to the entertainers differ from theirs? 12. What is the second “certain hope” that the narrator harbors (as he reads to Kaoru from her storyteller’s collection)? 13. Describe the structural/stylistic similarities between this work and Matsuo Bashō’s Oku no hosomichi (late 17th c.), and “diary literature” (nikki bungaku) in general. 14. What images of death appear in the work? Describe their significance. 15. Describe the purification/ablution scene at the spring/well. How is this similar to the Shintō ritual of “purification/ablution” (misogi 禊)? 16. Discuss the last scene. Why is the narrator crying again? Why does he eat the boy’s lunch “as though it were mine”? Why does his head feel “clear and empty”? What does he mean by a “beautiful emptiness”? Is this scene related to the ideas of banbutsu ichinyo (“unity of all beings/things”) in Zen Buddhism? The boy opened his lunch and I ate as though it were mine. Afterwards I covered myself with part of his cape. I floated in a beautiful emptiness, and it seemed natural that I should take advantage of his kindness. Everything sank into an enfolding harmony. The lights went out, the smell of the sea and of the fish in the hold grew stronger. In the darkness, warmed by the boy beside me, I gave myself up to my tears. It was as though my head had turned to clear water; it was falling pleasantly away drop by drop; soon nothing wood remain. 17. Do you think the narrator will ever see the entertainers again? Translated by Edward Seidensticker; originally published in The Atlantic Monthly, January 1955. Intrasexual harassment (同性間のセクハラ), maternity harassment (マタハラ), academic harassment (アカハラ), doctor harassment (ドクハラ), power harassment (パワハラ), sensei harassment (センハラ), housekeeping-labor harassment (家事ハラ)... I'm as against harassment as the next with-it upper-middle-class liberal dude, but I'm beginning to foresee a future where all forms of human interaction are banned under the rubric of harassment；the solution to all these real problems is not an expansion of the concept of harassment but a strengthening of labor unions/anti-exploitation laws/etc--in short, the establishment of an authentic Left. *150 minutes; with quality English subtitles. *from the second disc of the Region 1 Criterion Collection release of Mizoguchi's Ugetsu monogatari (1953). 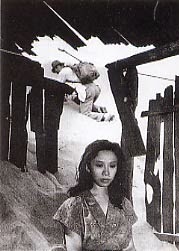 Title: The Face of Another (他人の顔, Tanin no kao; 1966). 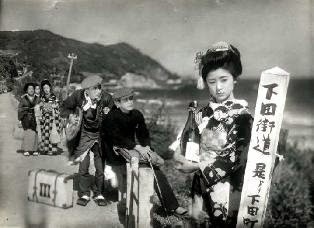 Based on Abe Kōbō's 1964 novel of the same name.